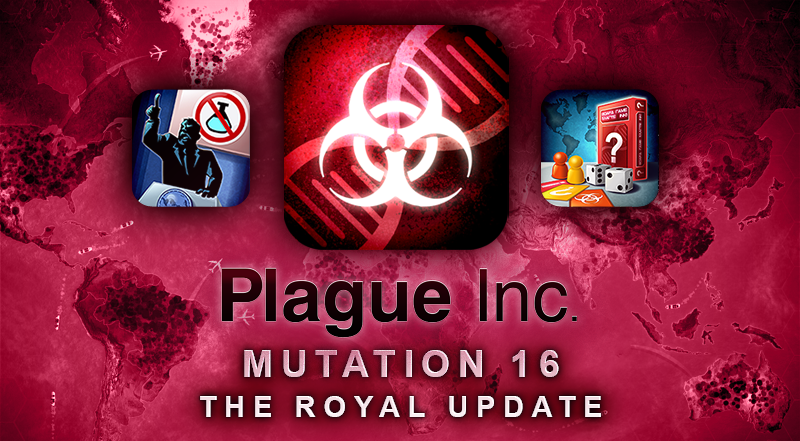 Get ready for a huge overhaul plus new content in Plague Inc.
Pay no attention to the royal wedding that happened this past weekend; the only real royal news that matters is about The Royal Update to Plague Inc. The game won The Queen’s Enterprise Award for Innovation, and what better way to celebrate than by naming Mutation 16 after it? There is release date is set — expect it “soon” for the iOS build — so I’ll just be updating my App Store several times per day hoping for it to pop up. This update includes the first interface overhaul that Plague Inc. has gotten since it was launched six years ago, and developer Ndemic promises it will look “816% better.” This is something sorely needed, as more content was added but the menus remain the same and it’s become a mishmash of options. More importantly, the update includes two new Scenarios. I’m most excited for the Ultimate Boards Games scenario has nothing to do with disease, as investors have given you two years to create your own board game and infecting the world with fun. The second is far more depressing, as people have stopped believing in science, medicine, and diseases. A single country offers scientists and medical staff refuge, and it’s up to you to wipe them out. Yes, you need to wipe out those trying to cure diseases. It’s so dark and twisty. With a critically acclaimed bittersweet story, To the Moon has long been revered as a game to experience. With the plot focusing on two doctors fulfilling a dying man’s last wish using artificial memories, the game has been one that tugs on the heart strings of its audience. Now, developer Freebird Games is set move the experience into the animated world. Revealing the news via the studio’s video blog, To the Moon creator Kan Gao said that the animation is being done by “first-tier” studios who are “pretty big players in the [Japanese] animation industry”. He also revealed that the animated film has been in pre-production for around two years with the budget of the film been “significant” and “somewhere above” that of 2016 surprise hit Your Name. The games studio will also be involved with script writing and additional consultation on the project. Kan Gao promises that his studio is also still moving forward with additional video game titles yet to be announced. Devolver is one of my favourite publishers; it publishes the fun, whacky games that nobody expects to exist! Needless to say, I’m perhaps most excited for the Devolver Digital’s E3 press conference this year, titled Devolver Digital’s Big Fancy Press Conference 2018. Beginning at 8 p.m. PDT on Sunday, June 10, the conference will be live-streamed on Twitch. This year’s Big Fancy Press Conference will feature real, actual game reveals and technological innovations from Devolver Labs, the research and development arm of Devolver Digital responsible for last year’s Earliest Access program and making ‘throwing money at the screen’ a valid form of payment. There will almost certainly be blood, possibly loss of life. 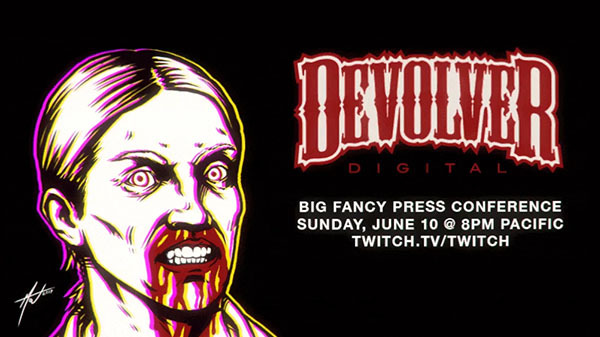 Potential concurrent viewers are encouraged to re-watch last year’s press conference as this year’s event aims to extend the Devolver Digital Press Conference Cinematic Universe (DDPCCU) through the blatant reuse of jokes and vague callbacks to the original. Pray for us. I am so incredibly excited about Shape of the World. No gunfire. No puzzles. No story. The game is pure, unadulterated exploration through a procedurally populated environment. How perfect does that sound?! A forest grows around you as you move amongst and interact with the environment. Areas change every time you pass through them, making it easy to get wonderfully lost in the game. Aside from the forest, you’ll also find aquatic caves and peaceful shores. The soundtrack even shifts depending on what you do, promising to amplify immersion. Developed by Hollow Tree Games and published by Plug In Digital, Shape of the World will be released for PC via Steam and PlayStation 4 on June 5, with the Xbox One and Switch versions launching on June 6.